Adventures in Beginner Knitting: This is a lens that is sort of a journalish-type writing that following my adventure in learning to knit, and I hope to help and encourage other knitters, too. Nerdy Knitting: There needs to be a concise repository for nerdy knitting patterns, and I made one! 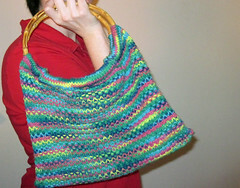 I keep building it and adding new patterns as I come across them on the Web. Chemo Caps: This is my most popular lens. I have been knitting hats for cancer patients and donating those hats to a local cancer center. I taken special requests for hats, too. I am trying to encourage others to do so, as well. You can also find me over on Ravelry, too.